The concept of tapping the thermal energy from the world’s oceans has been around for a long time. With the first OTEC plant being built in 1930, many smaller and larger scale pilot plants have been constructed since then. Alongside these demonstration projects, several initiatives emerged, both private and public, that aimed at advancing OTEC development. In general, their goal was to increase knowledge sharing amongst researchers, investors and enthusiasts, while some of the OTEC initiatives actively lobbied at central governments for their financial support of the technology. This article wants to highlight a few of these initiatives and make a bridge to the OTEC foundation today. 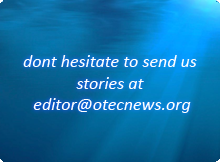 The first OTEC initiative that was of significance was the privately funded OTEC Liaison, a monthly newsletter published by Richard Meyer from 1977 to 1983 containing (international) OTEC news, research updates, conference proceedings, questionnaires, interviews et cetera. In addition to the OTEC liaison, Richard Meyer also founded the Ocean Energy Council (OEC) in 1979, created “as an advocacy body favoring the development and implementation of ocean energy”. Its purposes included improving public knowledge and acceptance of ocean energy/OTEC as a viable resource. Also, the OEC was lobbying at the United States’ Department of Energy. OEC ceased operations in 1982, but revived in 2004 as both energy (oil) market conditions and ocean technology have changed. In 1989 the International OTEC Association (chaired by Michel Gauthier) was founded by a group of 50 OTEC experts from all over the world to cooperate and share knowledge in the field of OTEC and deep ocean water applications. The website otecnews.org was opened in 2001 by Thomas Bjelkeman, providing the latest news on OTEC and related technologies. The Japanese Organization for Promotion of Ocean Thermal Energy Conversion (OPOTEC) was founded in 2005, focusing more on doing research and stimulating the commercialization of OTEC. The Ocean Energy Institute, founded by Matthew Simmons in 2007 operated a think tank and venture capital fund addressing the challenges of U.S. offshore renewable energy. In 2011 OTEC Africa, a combined aid and development project, was established to promote OTEC towards developing aid agencies. Over the last years, the role of social media has become visible: OTEC has its own group on both Facebook and LinkedIn, with over 250 members. In particular the OTEC LinkedIn group provides a central place to share information, discuss about OTEC, and cluster as professional community working on or interested in OTEC. In addition to the independent OTEC initiatives, regional and national governments have also made their contribution to the development of OTEC. Usually in cooperation with academics, governments facilitated and financed research and pilot projects. The US National Renewable Energy Laboratory and Indian National Institute of Ocean Technology are good examples. The Ocean Energy Systems is an intergovernmental organization established by the International Energy Agency in Paris, also aims at knowledge sharing in the field of ocean energy systems. Today, many exciting new OTEC developments are picking up worldwide. The time is right for a big push. In order to assist the OTEC sector as a whole, a collaborative initiative was initiated to stimulate OTEC developments, the “OTEC foundation”. The OTEC foundation will serve as a portal centralizing all relevant information and will be managing and updating the OTEC news website, http://www.otecnews.org, and the OTEC LinkedIn Group.